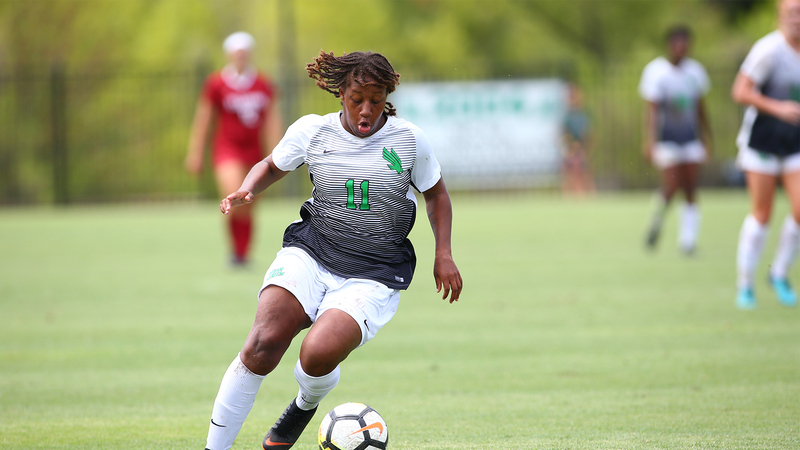 The North Texas Women’s Soccer team got a two-goal performance from sophomore Berklee Peters and senior Aaliyah Nolan in route to a 4-0 victory over UT San Antonio Sunday afternoon at home. Sunday's victory is the team's fifth consecutive win and its third-straight shutout. During their five-match winning streak, North Texas are outscoring their opponents 14-1 and have outscored all nine of their opponents this season by a combined score of 22-3. North Texas took a 2-0 lead in the match's first eight minutes when Peters scored on the team's first two shot attempts. Sunday was her third multi-goal performance of her college career giving her three goals on the season. UTSA didn't give in and picked up momentum late in the first-half. After a few halftime adjustments, North Texas regained their typical defensive stoutness as they kept the UTSA possessions to a minimum and the offensive capitalized on opportunities. No one on UNT capitalized more than Nolan. Looking to give the team a jolt, the Bermuda native took just two shots on the day and they came within two minutes of each other but she scored on both and gave the team the boost they needed. The first goal came from inside the box and the second from roughly 18 yards out as she fired it with her left foot. The two goals came in the 64th and 66th minute of the match.